A Well Oiled, Efficient Ocean? If you aren't moved by the images from the Gulf of Mexico as oil gushes forth into that marine system, you should check your pulse. Boyce Thorne Miller's piece "All the King's Horses..." walks us through the history of the Gulf and what we need to do to make sure we prevent future mistakes that will not only affect the marine ecosystem but the lives of those who depend on it for their livelihoods. The decision to drill is supposedly all about getting us fuel the most economically efficient way possible. We are now seeing the real cost of cheap fuel. But the wrongful application of economic efficiency doesn't stop at drilling for oil. Decisions are too often made using a false definition of economic efficiency, usually narrowly focused on the lowest cost of production. 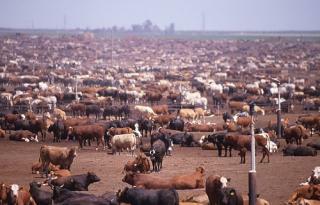 When it comes to food systems, feeding the world's hungry is used as an excuse to employ industrial systems A Sea of Cows: Image courtesy of Flickr. that argue they have the lowest cost of production. This argument ushered in the Green Revolution and the ecological, economic, community, and health problems it brought along. Somewhere along the line, advocates for industrialization forgot that lowest cost of production is what you jump to if all other values are equal. When it came to our food grown on land, the family farmers plight was couched as purely an economic one. Therefore, agribusiness argued that the least efficient small and medium sized farms - had to go because they wouldn't be able to provide mass quantities of food cheaply enough to feed the world. No one asked cheap food at what cost. What didn't happen at the onset of the farm crisis and we know now mostly due to hindsight, is that all other values were, in fact, not equal. Consolidation came with economic, ecological, health and community costs. Since many marine animals are caught to feed our food systems, as fisheries managers and policy makers ponder whether and how to consolidate the fishing industry, it's important to remind them what we have learned in hind sight particularly if the argument in favor of consolidation is that those who can catch the most with the lowest cost of production should be fishing because we now know that all other values are not equal. As laid out by Brett Tolley in his piece "No Consolidation Without Vision," the time is now to let the policy makers know that you don't want the mistakes of the past repeated. You can add your voice to others' by signing the Fleet Vision petition. And while you are here, please take a moment and welcome Sean Sullivan to NAMA staff. You can read more about Sean below. We're glad to have him on board. His addition is sure to make our operations much more efficient! Make no mistake; the Gulf of Mexico ecosystem is broken, perhaps beyond repair - certainly beyond our ability to repair it. If somehow the shattered pieces come back together Bird in Oil: Image courtesy of the EPAagain, it's pretty certain it won't look or function like it did before the spill. Many who don't live along the Gulf coast will probably have forgotten what that was like anyway. But those Louisianans, Arkansans, Mississippians, Alabamans, and Floridians, Texans (and perhaps others) whose health, livelihoods, and happiness are destroyed by this event will not soon forget. Can we help our fellow fishing communities? Can we prevent similar disasters from happening in the future - there and here? It could have been that magic moment when a sea worm on a hook lowered into the sea results in a shiny wondrous living fish flopping around on the dock. Or it could have been a deep affection for the proud nosed workboats that cluttered the harbor in my youth, each telling a story by their wear and tear and the condition of their paint. It could have been one of those moments or a collection of a thousand fleeting glances at the ocean, a seemingly involuntary need to see it each day and register its temper. I still don't know how or why the ocean gets into one's blood, but I do know when it gets there it stays there. During my college years, living in Portland, OR, a true deepwater port but 100 miles from the ocean proper, a constant longing for the intimate shores of the New England coast dwelled within me. It pained my mother to hear that I missed the ocean more than her cooking...to continue reading this article, please click here. No Consolidation Without Vision - Take Action Now! If we truly care about our oceans and our fisheries, then "WHO" fishes matters! The New England Fisheries Management Council has made clear that fleet reduction is a priority in order to reduce total catch. However, a Council vision for who stays and who goes is absent. 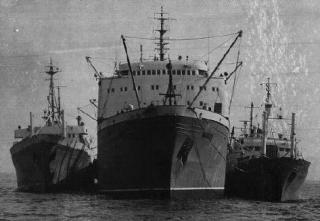 We learned from the experience of US farm policy that consolidation without a vision resulted in large-scale factory farming corporations driving out family Soviet Factory Ship: image courtesy of NOAA.farmers and degrading the land based environment, biodiversity, and security of the food system in this country. As it did this, it also destroyed the fabric and vitality of farming communities in the heartland. Consolidation without a vision could result in a small fleet of homogeneous large-scale boats that fish from only a few ports and use a narrow range of gear types, scale and sizes. We know fisheries around world that have consolidated without a vision didn't achieve the ecological outcomes promised during the process...to continue reading ths article please click here.